Having aided JJ Gonson from Cuisine En Locale in the past, when I heard about JJ's next O.N.C.E. one month ago, I knew I had to take part. JJ's O.N.C.E. 's, or One Night Culinary Events, are multi-course meals held on short notice sporadically throughout the year, and include as much locally sourced food as possible. Venue: Club Oberon, home of the American Repetory Theater's The Donkey Show. Dante's Inferno is the first of three parts of Dante Alighieri's allegorical work, The Divine Comedy. This poem describes Dante's journey through Hell (Inferno), Purgatory (Purgatorio), and Heaven (Paradiso). The great Roman poet Virgil is Dante's first guide, and it would be he who would lead guests through Inferno and the 9 Circles of Hell, in what would be a magnificent production. Weeks of work were put into the event, from all aspects of production and people of all talents. As a part of the kitchen crew last Tuesday, I was led by the three chefs of the show: JJ Gonson, Trevor Smith, and also Jennifer Ede, who did an amazing job communicating between the kitchen crew and the servers. The kitchen work involved some very intense chopping, cooking, dishwashing, and plating to serve approximately sixty people, and the work could not have been done without the contribution of many other Cuisine En Locale volunteers. Because of the intensity of the work, the time flew by. And before I knew it, we were already plating the tenth course, Heaven. Virgil, our guide for the night, led us through the 9 Circles of Hell, each with its own culinary, theatrical, and musical interpretation, for the evening. The night began in "Limbo," with a Clear Flour bread roll and water. Next, the two lovers Paolo and Francesca tangoed in "Lust," while we were served a Duxbury oyster shooter with a Keown Orchards Green Apple mignonette sauce. Guests were subsequently brought to the third course, Gluttony, where the servers, who were essential to creating the feel for the evening, carelessly tossed baked beans and Stillman's apple cider-glazed pork ribs in our plastic bowls with extremely large spoons. As we were served, Virgil led Cerberus, 3-headed dog and guardian of the Gluttons, engage in an eating contest with himself and a large bowl of beans. "Wrath" presented irritated and impatient waiters. So if you had been too busy enjoying the show rather than eating, you had best be prepared to wolf down the Jasmine kale salad with Grapes of Wrath Vinaigrette. "Heresy" was next, with a lobster salad enclosed in a delicate and flakey tomb-shaped puff pastry, adorned in a chili pumpkin sauce. We were then taken to the seventh course, "Violence," where the Minotaur, part man, part beast, tore beets and smeared the "blood" all over his body, as we were served Jen's dark-red, sauerkraut cold beet soup, topped with white creme fraiche. "Fraud" followed as the eighth course, where guests received, suprise: Tofu Wellington, not the anticipated Beef Wellington that was written on the menu. In "Treachery," we were given Beelzebub's Beelzeburger, as the servers rocked out to a song about fast food. And then Lucifer came forth, Prince of Hell. After the nine circles of Hell (and bypassing Purgatory), we found ourselves in Heaven, guided by Dante's dead and beloved Beatrice (who did some amazing acrobatics), and where Dante comes face to face with God (Anthony Saffery), who strummed some lovely tunes on the guitar. It was a wonderful, entertaining night, and enjoyable in more ways than one. Many thanks to Clear Flour, Keown Orchards, Stillman's Farm, Verril Farms, and Sherman Market, who provided much of the locally sourced food for the night. And a big thank you to everyone else who made these nights possible, including the servers, actors, dancers and Oberon staff, the sound, production, and tech staff, the Cuisine En Locale crew, volunteers, and many others! For another take on the event, a more detailed course-by-course description of the night, and some links to the musical components of the evening, I encourage you to read this review on LimeyG bends yer lughole. It was wonderful to not only be a part of the kitchen crew one night, but also to be able to enjoy and appreciate the show on another evening as well. I am already looking forward to the next O.N.C.E. 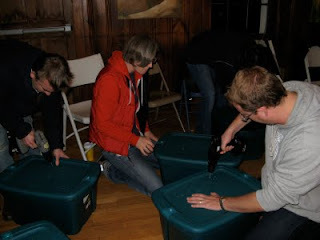 A few weeks ago I had the chance to attend the Urban Homesteaders' League's Vermicomposting Extravaganza workshop with Ryan Gray. And last Saturday, I finally received my worms! 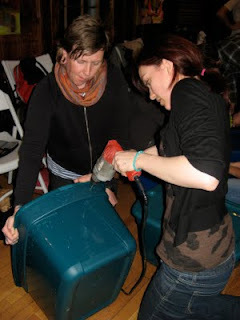 Before the workshop I didn't realize how easy and simple vermicomposting actually is, and I am very excited to start! Vermicomposting is a method using earthworms to turn food/organic waste into nutrient-rich compost. Vermicompost contains worm castings, bedding materials, and organic wastes at various stages of decomposition, and contains worms at various stages of development and other microorganisms associated with the composting process (2). Worm castings, or worm poop, is the end product formed after the earthworms break down organic materials. Worm castings contains many beneficial microbes and nutrients and is a very nutrient-rich plant fertilizer (2). Vermicomposting is perfect for those living in urban areas. And if you are composting correctly, the compost bin shouldn't even smell at all! What do you need to begin vermicomposting? Bedding material, such as shredded newspaper. Ink should be soy-based! Redworms aka red wigglers or Eisenia fetida (Get them from a friend, or order them online, such as from WormWoman). Completely FILL your bin with bedding, such as shredded newspaper. Ryan recommends to shred the newspaper thin, around ¼ to ½ inch thick. Worms breathe through their skin, so the bedding needs to be moist. Spray the newspaper so that it's "fluffy and damp," but not soaking. You don't want your worms to drown! Add the redworms and some food scraps to the bottom of your bin and let them get to work! Be careful about OVERFEEDING your worms. You want to avoid the odors of rotting food, and you want to give the worms enough room to move around as they get adjusted in their new home! Once your worms begin reproducing and become assimilated to their environment, you can begin feeding them more. Have excess food scraps? Refrigerate or freeze them for later! You can add more bedding if it gets low, and be cautious that the bin doesn't become too moist. Every few months, harvest your fertilizer! One easy way to do this is to put food scraps on one side of your bin to attract the majority of your worms (or you can also do this on the ground on top of some spread out newspaper/plastic). Once you've gathered /separated your compost and picked out any extra worms hiding inside, add some new bedding to your bin and you can begin the process all over again! Redworms are happiest at ~60-75 degrees F, but they can survive at temperatures of 50-80 degrees F.
Citrus fruits- at a minimum, or just avoid them! The smaller the food scraps/the larger the surface area of your food, the easier it will be for the worms to break it down! They "lick" rather than chew. Once you've got your bin going, join your fellow vermicomposters here! 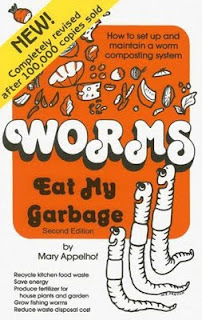 -Fun fact: Worms eat over half their body weight in organic matter a day. What to do with your food scraps that aren't good for your redworms, or what to do if you aren't up for vermicomposting just yet? Whole Foods on Prospect St. in Cambridge accepts compost in their public recycling center at the back of their parking lot! Vermicomposting is a wonderful way to recycle your food and to create some very healthy and nutrient-rich soil! Have questions for Ryan about vermicomposting? Contact him at compostboy[at]yahoo.com. Thanks to Ryan for a great workshop, great information, and for breaking down vermicomposting into a simple and easy process. Thanks to Erik Zornik as well, who also provided some great tips. 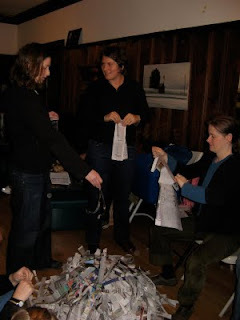 And of course, thanks to the Urban Homesteaders' League for hosting this workshop. Look forward to an upcoming blog post on Worm Updates in the next few weeks!